Because every modern shooter needs a bow. Digital Extreme has finally entered Warframe into its open beta testing phase and with a brand new update to accompany it. Update 7.0 features all new Warframe characters, weapons, a snowy battleground, and much more! Players will be happy to hear that two new Warframe characters have been released for the beta: The Saryn, who has a corrosive attack that can melt either organic or non-organic matter, and The Banshee, who uses sonic-boosted attacks for massive AOE damage. Equipping them with the new “Paris” hunting bow, the fully automatic pistol called the “Viper”, or the deadly “Fang” daggers, will make their ninja-like tactics that much deadlier on the battlefield. 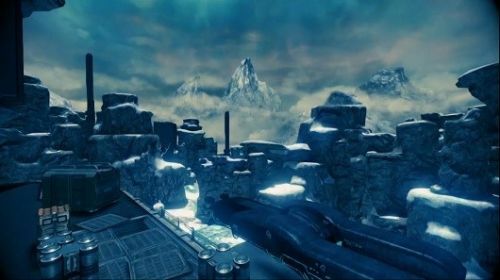 Speaking of which, the brand new snow-themed level, Corpus Outpost, will have an open-ended environment for lots of strategic options and exploration. Lots of walls to run along on the new 'Corpus Outpost' map. Players that have participated in the closed beta of Warframe addressed many of the balance issues that Digital Extremes was looking to correct. The Mod 2.0 system now prevents players from using the same mods to be stackable for any given weapon. Warframe abilities and weapons are also now polished and ready for the open beta. Last but not least, a survival mode has also been put into place, known only as “Endless Defense”. The mode has staple objectives found in most other Survival gametypes; players defeating wave after wave of enemy Warframes to see how long they can last. All of these changes can be found on the official Warframe forums, so make sure to take a look. Warframe has yet to receive its release date, but participate in the open beta and leave your feedback for Digital Extremes! Page created in 0.3078 seconds.